Made a good start due to the poor weather. I'll be using the laser cut parts and going electric as I don't have anything IC that small! Plus I have the motor and ESC left over from my BH Speed Air so I might as well use the bits up. 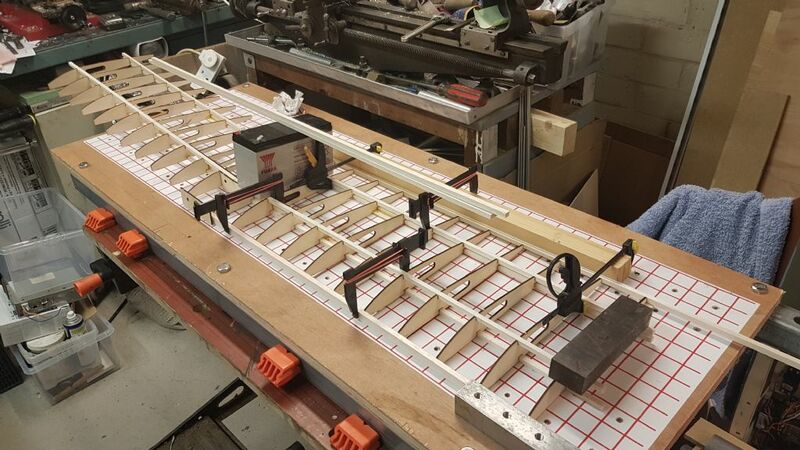 Fuselage under construction and other sections of wings being CA'ed. That looks a great start Chris. Slow progress as I have been doing other modelling and non modelling bits and bobs. Got stuck with wing ribs as near the centre section as I have too many ribs and did not realise the importance of which one goes where. On to the fuselage and I thought I would dry fit all the way back to the tail. Its not clear to me how the stringers all converge on various ply formers. I'll post photos on the main MB forum thread. 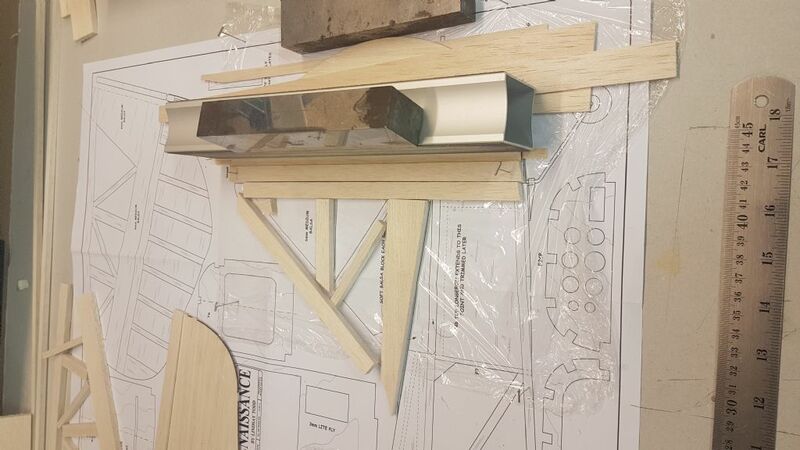 Back to the wing tonight and after LPP suggestion that the centre line for the wing on the plan was in the wrong place and a few checks by me I was happy to glue it together. 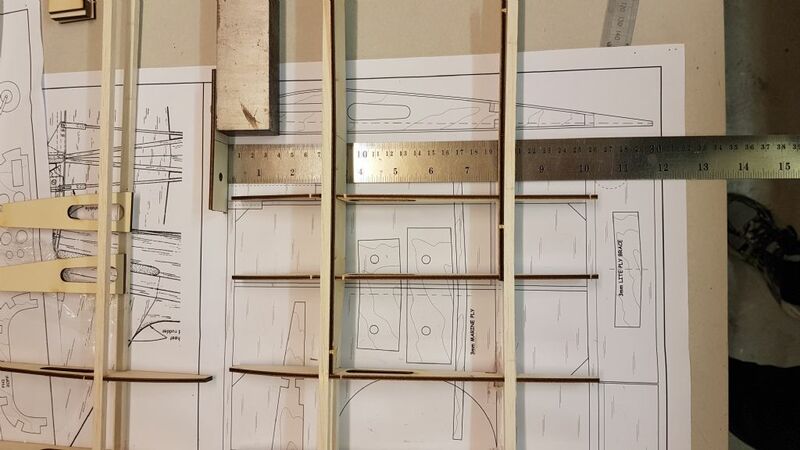 I need to make a couple of 36mm wingtip blocks to get the 3 degrees of dihedral and I should have the basis wing structure finished. Looking quite nice, just hope it is! 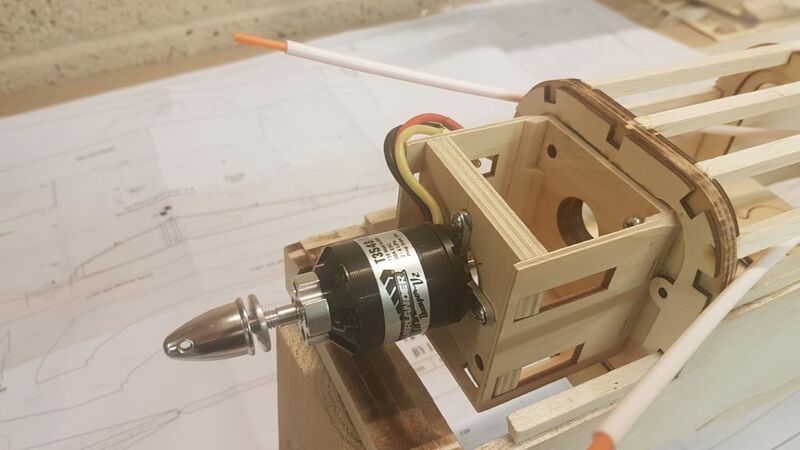 Had a bit of success with the electric motor mount as I didn't like the look of long studs (nothing wrong) just I remembered I had a couple of "spare" motor extension boxes from ARTF ic models. Completely justified storing a shed full of bits and now I have used a part! Photo to be sent once I get to the shed again. Do I just glue the rear fuselage together construct the tail and sandwich it (seem logical to me), just can't tell on the drawings? 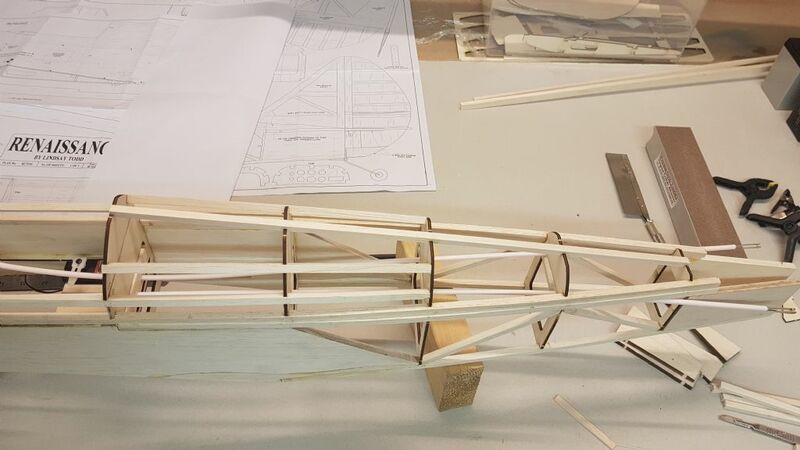 Is it better to shape the things like the top rear fuselage capping and then glue or glue the square and shape in-situ? Glue in place first Chris, then carefully ( bit by bit) plane and sand to shape.......... oh, and check regularly when using the plane, as you don't want to remove too much wood. Just to clarify Chris, which bit do you mean exactly? Did you mean the bit where the fin glues on? Tony's looks like this and I was wondering if its easier on or off the model to get the shape? 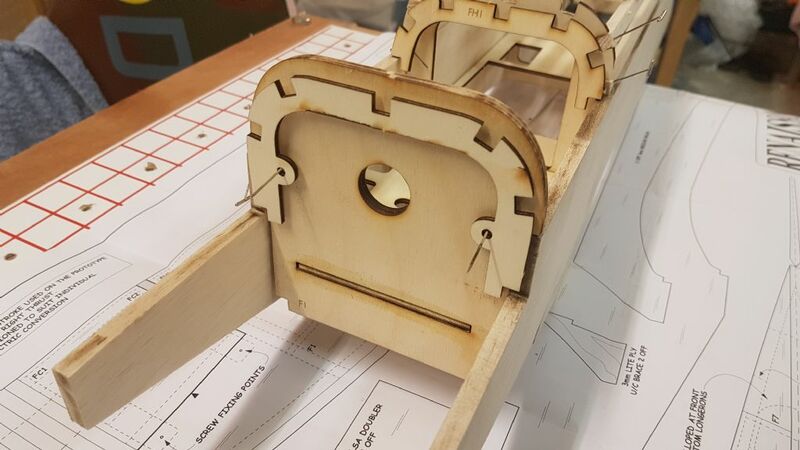 PS - I have found a photo of the rear fuselage, so that's sorted. I glued it to the model and then shaped it. Still to sand a bit yet, but i found that easier than if it was loose. PS I used a motor mount that was spare from an ARTF kit ...just need to find my ESC I have left somewhere! As someone else said, that is a solid motor mount! 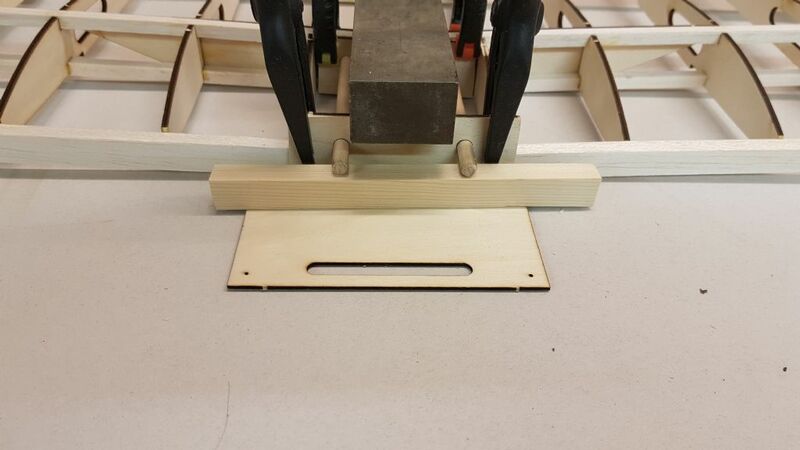 Any fancy shaped bits such as that are far better planed/sanded in situ. You'd find it rather awkward to do it in your hands. 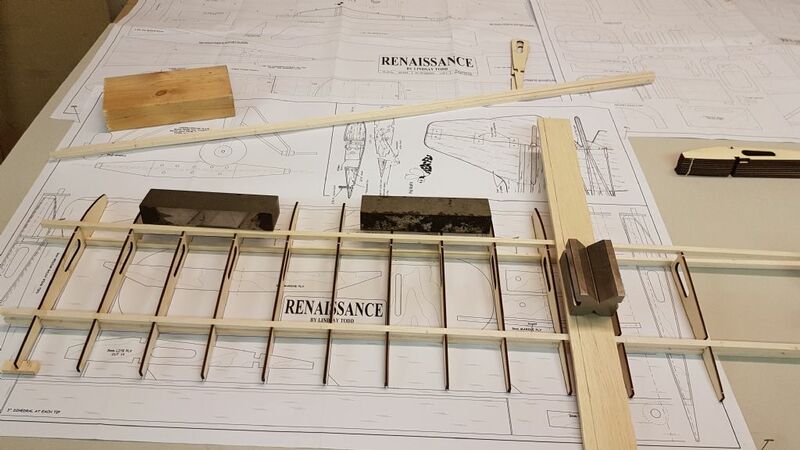 It's a similar scenario when you're cutting a solid aileron from a sheet of balsa. I usually plane and sand it to shape first, then cut/release it from the sheet. Update time even if it just a couple of small things! 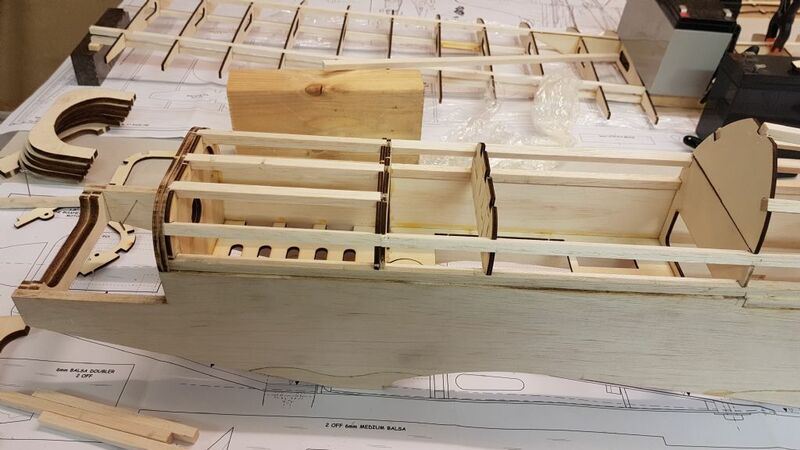 Centre section of the wing progressing and a bit more of the front fuselage done. If anyone has finished the back of the wing mounting holes etc a photo would assist. 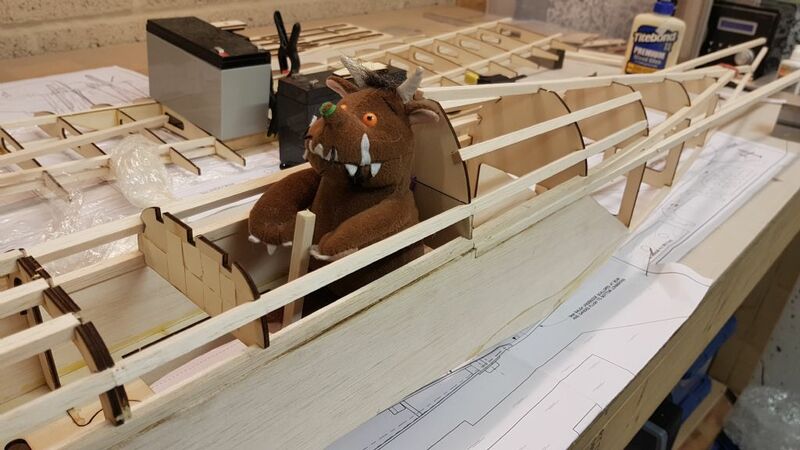 hi Chris, I have started on the wings and would ask what size of block did you put under the ends to get the correct dihedral? would save me calculating It and getting it wrong lol. Will do once I get home as I didn't record what I did. 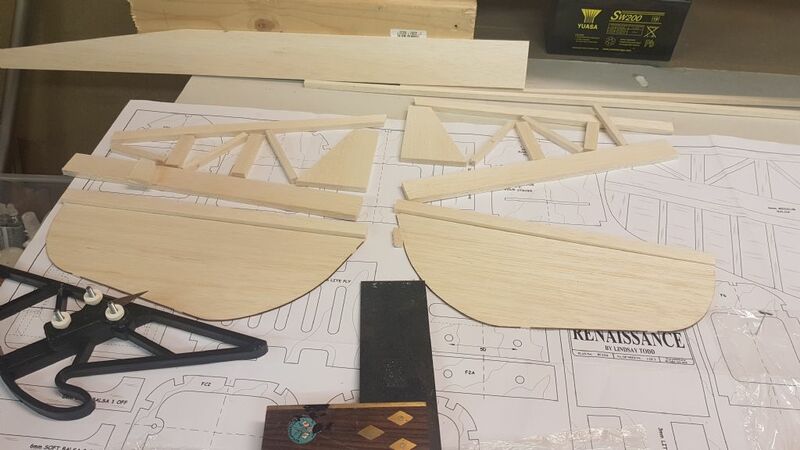 Don't forget to use your washout blocks when you are gluing the wings together so as to the dihedral and the washout. Still need to work out how I the do it again upside down when sheeting the wings, as that apparently stops the tristing in the future! 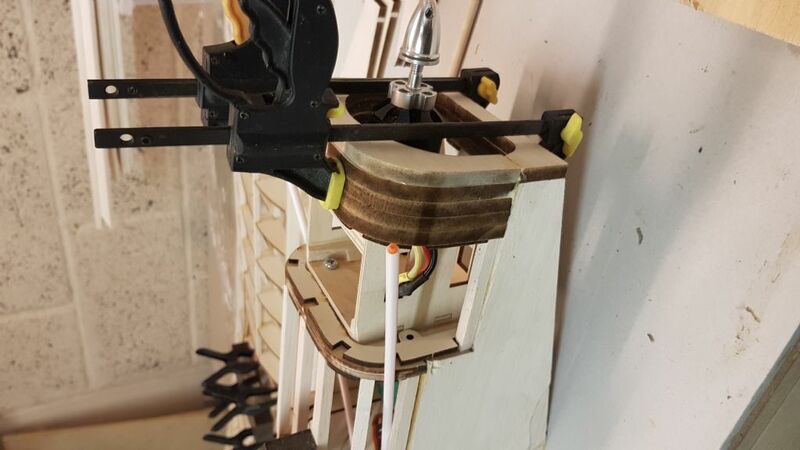 I glued one with the dihedral braces and let it set. Then glued the other tipped up. Not saying I am right, but here's my logic! Using a web calculator it comes up with 36mm (not forgetting your washout block!) 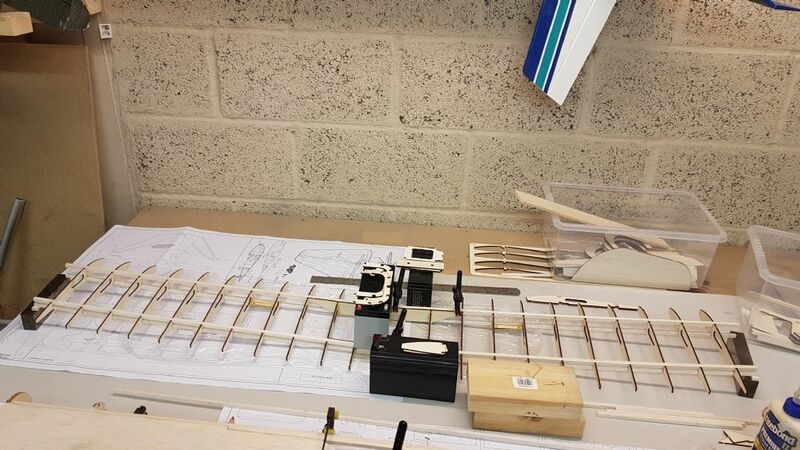 so lay one wing flat and set the other on 72mm (dihedral for both wings!) blocks.... still not forgetting your washout block! Thanks chris, so if l understand one wing flat with 6mm block under the end of the last former, other end 72mm in the air but the trailing edge 78mm to allow washout. Then sheet to allow this little distorsion to stay in the wing. If you do it the normal way up...you can join them, but not sheet the underside! Lifting the horizontal wing 78mm and upside down would mean you could join and sheet..too complicated for me.